Before you install Wallpaper by MyWayon your computer, perhaps you should consider all the pros and cons of having this application on board. Although it might look like this program could be your next best friend when it comes to your wallpaper collection, we would like to emphasize that Wallpaper by MyWay is a potentially unwanted program that could be associated with particular computer security issues. Not to mention that the program might have been installed on your PC accidentally. If that is really the case, you should not waste your time any longer: delete this application to make sure you avoid undesirable consequences. Our computer security experts have labeled Wallpaper by MyWay a potentially unwanted program because it is not a dangerous security threat. The point is that the application itself would not harm your system or you in any way. The problem with such pieces of software is that you can never be sure who will take advantage of Wallpaper by MyWay to promote their unreliable content. Since this application is avaialbe free of charge, it needs to cover its development costs somehow, right? So, to make up for everything it missed by going “free,” this program displays third-party commercial content and it gets paid each time you click it. If that was not enough, there is another thing why some users find Wallpaper by MyWay extremely annoying. If you happen to install the application automatically, without going through the installation wizard carefully, it is very likely that you will experience a browser settings modification. Your default homepage will be changed to home.wallpaper.myway.com, and there will be a new extension added to your browser. Now, it might seem that Wallpaper by MyWay has something in common with browser hijackers, but that is not exactly the case. We cannot consider this program a browser hijacker because it does not change your browser settings surreptitiously. Nevertheless, it is still an example of intrusive activity that should not be tolerated. So what if it offers you to “choose a unique layout” and to “make it scream “you.” If a program is associated with adware applications, you would put your guard up immediately. Do not be surprised to encounter pop-up ads if you continue using Wallpaper by MyWay. Needless to say, you should never click the ads you see because no one could guarantee that this advertisements lead to reliable websites. 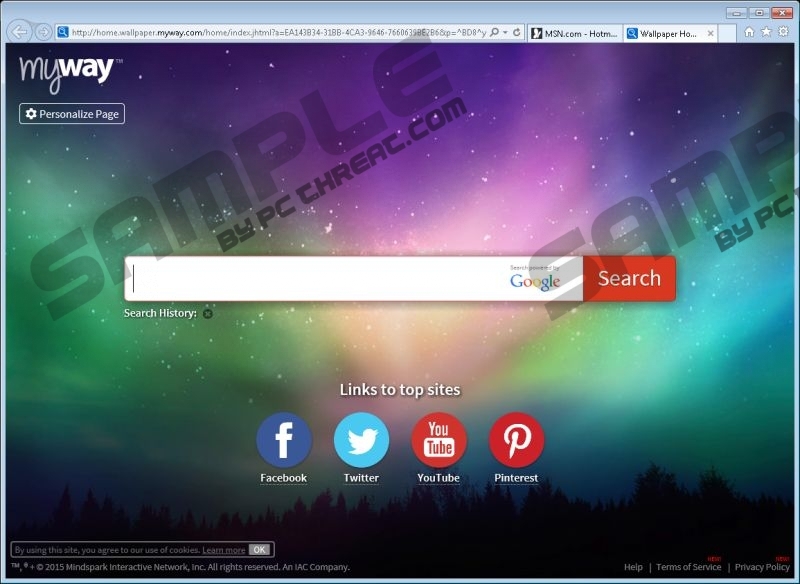 On top of that, Wallpaper by MyWay can function as a dead giveaway that you have more unwanted applications on your PC. Have been experiencing an increasing onslaught of annoying ads lately? Has your browser been acting up recently? The truth is, Wallpaper by MyWay might be just the tip of an iceberg, and perhaps it is time to do something about it. Scroll down for the manual removal instructions to get rid of Wallpaper by MyWay on your own. Also, try looking for other unfamiliar programs via Control Panel. If you cannot tell apart good programs and potential threats, you can always rely on a professional antispyware tool. Please let us know if you need any further assistance with ensure your computer’s safety and stability. Our support team is always ready to answer your queries. Press Win+R and the Run command prompt will pop up. Type “control” into the Open box and click OK.
Open Uninstall a program and remove Wallpaper by MyWay. Click Uninstall a program and remove Wallpaper by MyWay. Navigate to Add or remove programs and uninstall Wallpaper by MyWay. Quick & tested solution for Wallpaper by MyWay removal.